When I saw the Family Rules sign that Tara had for sale, I knew I had to have one. I'd had it saved in my inspirational images folder for I can't remember how long when I saw her post that they were making them again this Summer. Tara's husband Andy makes them, and they allow you to customize the rules for your family. The only change I made to their original version was that I asked Andy to replace "Forgive and Recover" with "Laugh Out Loud." To me, laughter is at the heart of all that's good in life, so it was important to me to have that reflected on the sign. SCREW FORGIVENESS! When it arrived, it took about five minutes for me to rip through the packaging and get that sucker on the wall. 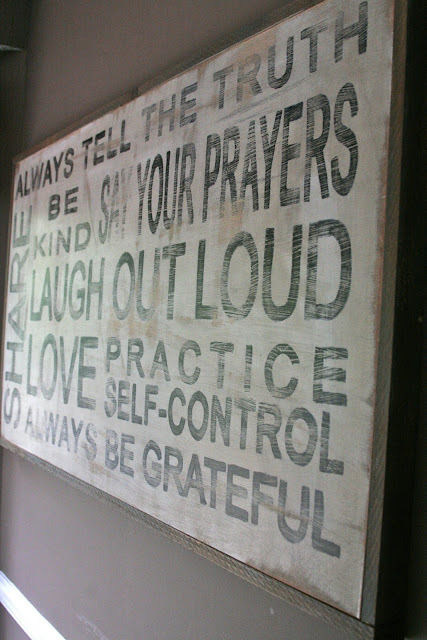 It's a light grey background with charcoal letters, and the whole thing is distressed. 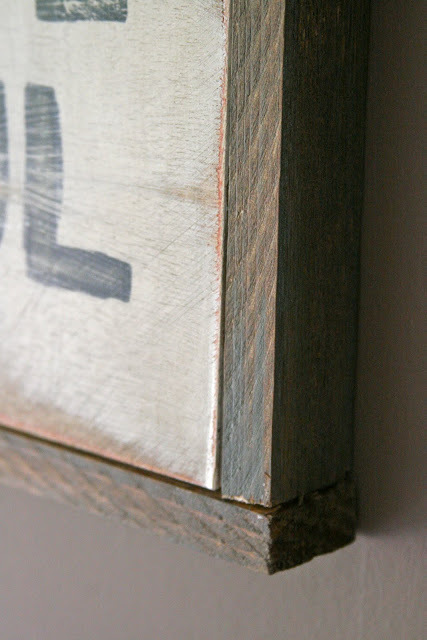 It's framed in a rustic finish, which is stained dark brown. The sign is large, 2 feet by three feet, which I wanted. 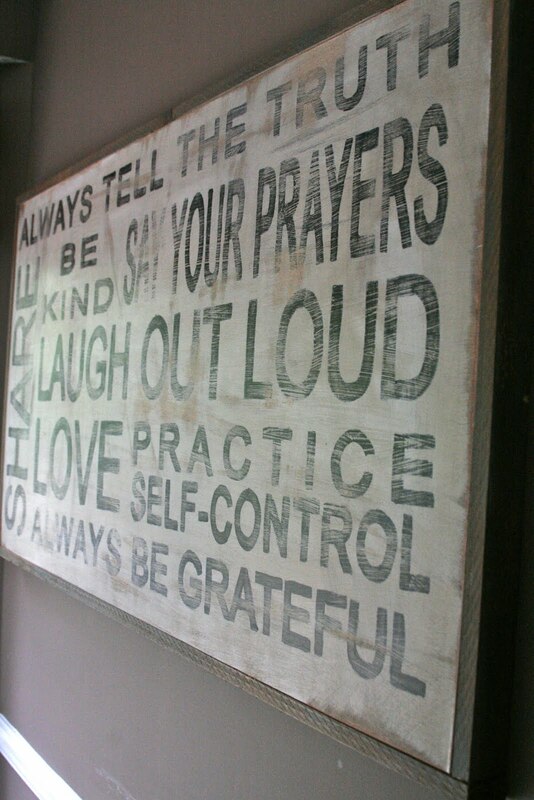 I'd found other customizable Family Rules signs on etsy and other places, but none of them were this big. I like big. The cost was $100 plus shipping, which varies from state to state. My shipping and handling charge was $30. Click here to get details on how to customize and order your own! Well, you made me LAUGH OUT LOUD, when you said, "SCREW FORGIVENESS!" When I click on the link, it goes nowhere. Where can I order this sign? Kay, I fixed the links! I can't find an e-mail address or blog for you, but you can click the links now, and they work. Hey!!! I'm so glad to see your sign that we made you! It looks so great in your home!! !